It's nice when your intuition is right, every once in a while. The father was horrified about the apparent liberal indoctrination going on here, so he checked with other parents of kids in the same class, and found that those children, too, had written the sentence down on a piece of paper. So the dad contacted The Blaze, and the story broke. Soon the district and the teacher who was identified as responsible, Cheryl Sabb, were receiving threats. It flew around the internet, especially on Facebook -- a posting of it I saw had garnered over 14,000 hits, and comments such as, "I HATE those goddamn liberal public schools. We should shut them all down," and "That teacher should be fired tomorrow, and so should the administrators who let this happen." Anyhow, I read this, and the entire time I was thinking, "This can't be right." Most of us teachers simply don't have time to proselytize even if we had the inclination. And in a fourth-grade class? Something seemed wrong here. But as befits my stance as a skeptic, I wasn't just going to write a post and say, "Hey, this doesn't feel right to me" when I didn't have any evidence to support my point. Lo and behold, though, I was right. The firestorm of controversy that was generated by the story led to an investigation, and the upshot of it was that damn near the entire story reported in The Blaze was flat-out wrong. The identified teacher, Cheryl Sabb, had nothing to do with it. 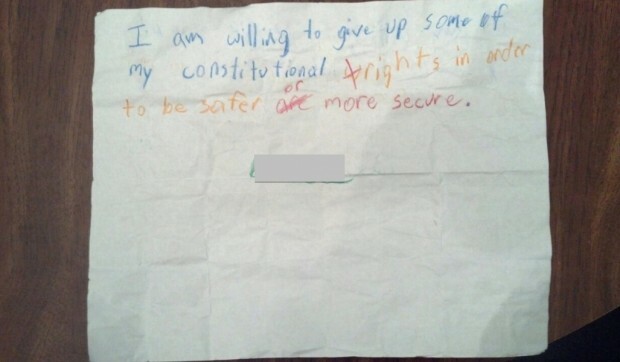 The note was part of a civics lesson on constitutional rights given to a class by a local attorney, who had instructed the children to write the sentence on a piece of paper -- and then state their opinion as to whether they agreed or disagreed with it, and craft an argument supporting their viewpoint. Several things about this debacle appall me. One is that no one in the chain of communication in the original story -- the father, the reporter who was contacted, the editor who approved the story for publication -- thought to do the one thing that seems ridiculously obvious to me, which is: call the teacher and find out for sure what happened. Even the kid was apparently too dumb to understand the point of the assignment -- the whole thing could have been avoided if the kid had simply said, "No, dad, that's not what the lesson was about." And then, The Blaze published a "followup" (it's linked at the top of the page for the original story) instead of doing what they should have done, which is publishing a retraction. Isn't that what responsible news sources do when they screw up royally? Oh, wait. We're talking about The Blaze. Never mind. And of course, the damage is done. Hardly anyone is circulating the actual correct information; this allows the people who hate public schools, who think they're little Liberal Indoctrination Camps, to go on living in their fantasy world. Glenn Beck and his cronies at The Blaze have nothing to gain by retracting the story; they've long been virulently against public education, and if the reputation of the public school system was damaged by their false reporting, so much the better. It leads me to wonder how much longer public schools will be able to survive. Between funding cuts, increasing mandates from state agencies (including adding more worthless standardized tests), and external attacks on teachers, it's a wonder any college student in his or her right mind would choose to go into teaching. I'm nearing the end of an (all things considered) happy career as a secondary-level science teacher, but if I were in college now, I wouldn't even consider teaching as an option. It's a hard enough job to do well at the best of times, but with the recent changes, it's becoming next to impossible. Some school districts can't find qualified applicants for job openings, leading them to eliminate positions, bump up class sizes, and (in some cases) hire uncertified individuals to teach children. The result: quality goes down, criticisms increase, schools receive more pressure to change, and the whole thing goes into an ever-faster downward spiral. I fear that the ultimate result will be the demolition of the entire system. Which I'm sure that Glenn Beck would applaud. But I hope he realizes what he's asking for. Public schooling in the United States, for all of its flaws, has been an amazingly successful social experiment. It started from the standpoint that (1) a general, broad-based education is good for everyone, and (2) all children should have the opportunity to learn, both of which ran counter to the earlier idea that only rich kids needed to be educated, and that the lower social and economic tiers were irredeemably stupid in any case. And I would argue that our society has benefited tremendously from this experiment -- the amount of creative talent wasted in earlier centuries by the decision not to offer education to most of the boys and almost all of the girls is one of the tragedies of our past. Any regular reader of this blog knows that I am no apologist for the Department of Education; I think that many of their decisions, apropos of the oversight of the school system, are downright destructive. But the way to effect change here is not to tear down the edifice itself. It's to use what we've learned about successful pedagogy from the people who know -- the teachers -- to guide policy, to improve the system from the inside out. But that's not what Glenn Beck et al. want to do. Their continual lobbing of verbal bombs at the school system has, as its aim, breaking the power of unions and remodeling teaching on conservative principles. (Recall that the actual, verbatim stance of the Texas Republican party is that they "oppose the teaching of higher-order thinking skills, values clarification, (and) critical thinking... which have the purpose of challenging students' fixed beliefs and undermining parental authority.") And judging by the reactions I saw to the civics lesson in Jacksonville, Beck and his followers are succeeding. I just hope that I'll be retired before the entire system collapses. I'm left shaking my head and wondering what the hell will happen to the world if we allow these people to continue to spread their lies, or even worse, procreate. Would it be too extreme to request a background check before allowing them to become parents? Is there some backwards 18th century constitutional amendment that protects that as well? Reason #1,867 I'm glad I'm Canadian.